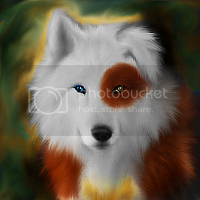 Kjintora Wolfe-Denahleigh is the illegitimate daughter of Kenna Foxleigh and Honrin Wolfe-Denahlii. Kjintora is a lovechild conceived through a moment of passion and lapsed judgment. She is a wolfdog, born into Cercatori d'Arte in the fall of 2013. Eyes: Heterochromia; Curious Blue (#33A1DE) (right) and Sun (#FCB514) (left). Optime Mane: Buttermilk (#FEF1B5) and Santa Fe (#B2754D). Bull Shot Brown (#7A4C1F) patch over left eye, spot on the back of right ear, tail tip, back saddle. Maize (#F5DCA3) upside-down triangular patch on her chest, along her abdomen starting under her breasts and stopping just before her navel. Dove Grey (#6B6B6B) toes and forearms, back saddle. A complex saddle blankets her back and hips with all of her fur colors; see reference. Kjintora is a second-generation wolfdog, blending her mother's rough collie heritage with her father's husky and shepherd. (Photo.) She appears mostly wolf-like in facial structure but has the defined, longer fur of a collie along her cheeks, chest, elbows, calves and tail. Her eyes are bicolored, the right displaying her mother's sky blue, and the left echoing her father's deep gold (the inverse of her grandmother, Jace). She stands tall and is built curvy and feminine. Her left ear is folded whereas her right remains erect. 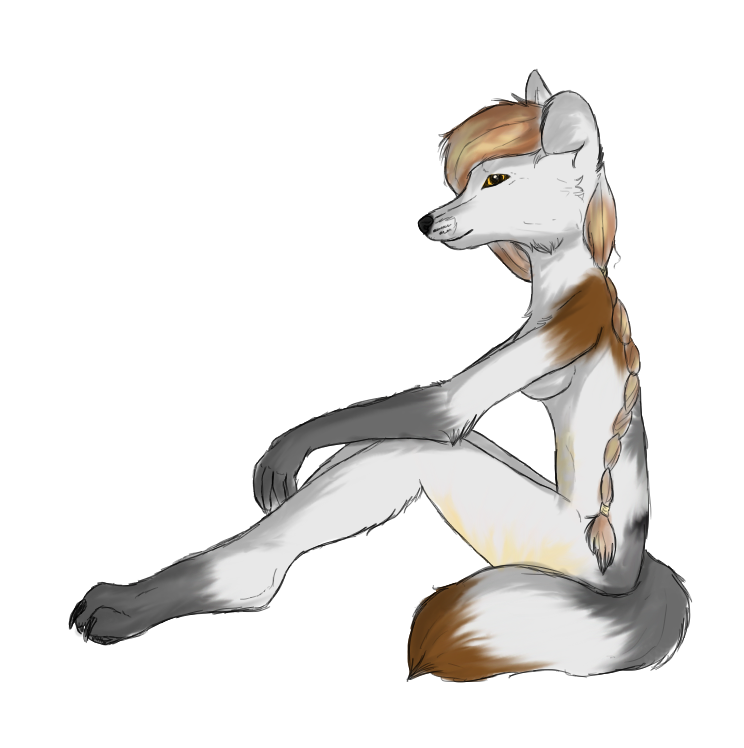 Her base color is White with markings in Brown, Grey and Cream. When shifted, she most often goes without clothes, but will sometimes wear a blue and brown tank top and a pair of tight capri pants when in optime form. Her Blonde and Light Brown hair is long, down to her rear and typically tied back in a braid. Kjin speaks confidently with a light western drawl. She uses slang like "y'all" and knows mostly curse words in Svinka. She has an excellent, strong singing voice that resembles a mix of Christina Aguilera and Adele. Kjintora's skills lie in singing and performing arts as well as working with animals. Kjin would like to get more practice in the ways of martial arts and combat like her grandma. She cannot for the life of her paint or carve. The visual arts elude her. Kjintora has inherited her father's ability to see ghosts. This fact troubles her greatly and she is prone to sudden panic attacks whenever this sixth sense overwhelms her. Kjintora lives on Prince Edward Island. Good: Intelligent, Observant, Witty, Flirtatious, Fun-Loving, Respectful, Calculating, Energetic, Inquisitive, Kind, Caring, Understanding. Open for expansion! Bad: Argumentative, Sarcastic, Blunt, Easily Offended, Indifferent, Stubborn, Enigmatic, Emotional. Open for expansion! Species: How do they feel about different species, perhaps? Maybe not just coyotes versus wolves, but how they feel about pets, how they feel about prey, etc. Non-Luperci: How do they feel about non-Luperci? Discuss the character's spirituality and religion under this section -- a brief overview goes here. She believes in (and sees) spirits. Kjintora is proud to be a part of the Wolfe-Denahlii clan and is loyal to her Foxleigh heritage as well. She's a little daunted by all her family members but tends to get along with all of them fairly well. While not a blood relative of the Kido family, she is considered an adopted member via her stepfather Adrian Kido. She accepts her sibling born of Adrian and Kenna unconditionally. Much like Honrin and Kenna's, Kjin and her mother have a somewhat two-sided relationship. One one side the two of them can be playful, laughing, cuddling and happy, on the other side the two will bicker and annoy one another. Kjintora and Kenna's relationship is GOOD. Kjin loves her father dearly, even though sometimes he can be so enigmatic she doesn't know how to approach him. The two of them get along really well otherwise. Kjintora and Honrin's relationship is GOOD. Born on November 8th, 2013 to Kenna Foxleigh and Honrin Wolfe-Denahlii, alongside her half-sibling littermates Oakley and Ty. Kjin is a lovechild conceived through a moment of passion and lapsed judgment; Honrin's unrequited feelings for Kenna turned out to be very much reciprocated, but despite it Kenna was unwilling to leave her mate, Adrian Kido. The complicated situation was not made any easier by Adrian's disappearance before the birth of the litter. (NPC) Holding On To Heaven (15 Nov) With the assistance of Honrin and Taliesin, Kenna gives birth to Oakley, Ty, and Kjintora.